It's easy to understand why Wall Street may not be bidding up big oil stocks to all-time highs, but shares of Eni, Royal Dutch Shell, and Marathon Oil look peculiarly cheap. The broader market may be hitting all-time highs, but the oil and gas industry is a long way off from hitting similar peaks. With oil still in the range of $50 a barrel, there are some companies in the business whose shares are still selling on the cheap. In fact, shares of Eni SpA (NYSE:E), Royal Dutch Shell (NYSE:RDS-A) (NYSE:RDS-B), and Marathon Oil (NYSE:MRO) are so cheap today that you have to really wonder what the market is thinking. 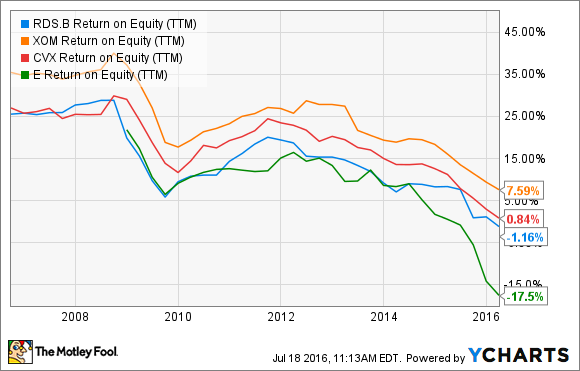 Let's take a look at why the market is assigning such low valuations to these oil and gas giants. What are we calling cheap, exactly? There are several valuation metrics out there that can show if a company is cheap or expensive at any given moment in time. The issue for investors is finding the measure that is most applicable to a company or an industry. For example, valuation metrics that use earnings or EBITDA aren't great for cyclical industries, because when earnings are at the top of the cycle, valuations can look cheap. Likewise, they can look prohibitively expensive at the bottom of the market. With cyclical industries such as oil and gas, we want to invest through the ups and downs of the industry, so these kinds of valuation metrics aren't that great for us. What is more indicative of a stock's value on the market today is the company's price to tangible book value. Oil and gas companies are very asset-heavy, and the underlying assets of the business are what the company's current and future earnings power will be based upon. So by assessing by price to tangible book value, you are more or less taking out the variability of earnings from the equation and valuing the stock mostly on its underlying business. Using this metric, shares of Eni, Royal Dutch Shell, and Marathon oil look really cheap. But are there real bargains to be had here? Italian oil giant Eni doesn't normally garner a lot of headlines, especially when it has to share the spotlight with larger integrated oil and gas companies like Shell, ExxonMobil, and Chevron. However, Eni has carved out its own unique niche. Over the past eight years, the company has had some huge successes in finding new oil and gas reserves. From 2008 to 2015, the company found close to 12 billion barrels of new reserves. That's almost triple the reserve additions that Eni's next closest peer pulled in at that time. Finding fields in less explored places also means that the company has some opportunities to sell partial ownership stakes in these finds that will help spread the development costs around and bring in a decent amount of cash to help Eni pay for its portion of their development. Despite the chance to capitalize on these large oil field positions and the company's prudent capital management as of late, Eni's shares trade at 1.05 times tangible book value -- basically, what investors would get if the company was liquidated today. Surely, Eni's future earnings power is worth more than liquidation value. Compared to its peers, Royal Dutch Shell's stock has typically traded at a discount, but for good reason. Historically, the company has generated lower returns on equity and returns on invested capital than its peers, and so investors have been less willing to pay up for its earnings power. RDS.B Return on Equity (TTM) data by YCharts. What makes Shell look more intriguing this time around is that the company is in the middle of a transformation that, according to management, will help generate better returns over the long term. After acquiring BG Group, the company plans to shed a bunch of its lower-return assets and consolidate the two companies' positions in places like offshore Brazil and in its liquefied natural gas business. It's far too early to know whether this plan will indeed work or not, but the market is currently awarding Shell a rather modest price of just 1.3 times tangible book value. Shell is a bit of a riskier investment than companies with more established histories of generating returns, like Chevron and ExxonMobil, but today's cheap stock price does make it worth considering. It normally takes a lot for a company's stock to be worth less than the tangible book value of its assets. Typically it means that the company is in severe financial distress, or it's in a business that is in structural decline. So Marathon Oil's price of just 0.65 times tangible book value would seem to indicate that something is really, really wrong. Yet a look at its business shows that the company doesn't seem to be that far off from most of its peers. Sure, the company's capital spending is still a bit more than the cash coming in the door, but that isn't atypical for producers today, with oil prices hovering around $50 a barrel. The better sign is that the company is scaling back spending and concentrating its efforts on some of its high-value positions while keeping production levels rather steady. Marathon is making a big push with its shale acreage in what it's calling the SCOOP and STACK shale reservoirs in the Northern Texas-Oklahoma panhandle region. The company claims that even at $50 per barrel crude it can generate internal rates of return in excess of 70%. If that is indeed the case, then Marathon's current asset base is worth more than what the market is assigning it. Granted, Marathon is still an investment that is very dependent on sustained higher oil prices, and without assets in other parts of oil and gas like refining and logistics, the company is at risk for another cash crunch the next time oil prices hit the skids. At today's stock price, though, it may be at least worth a look.